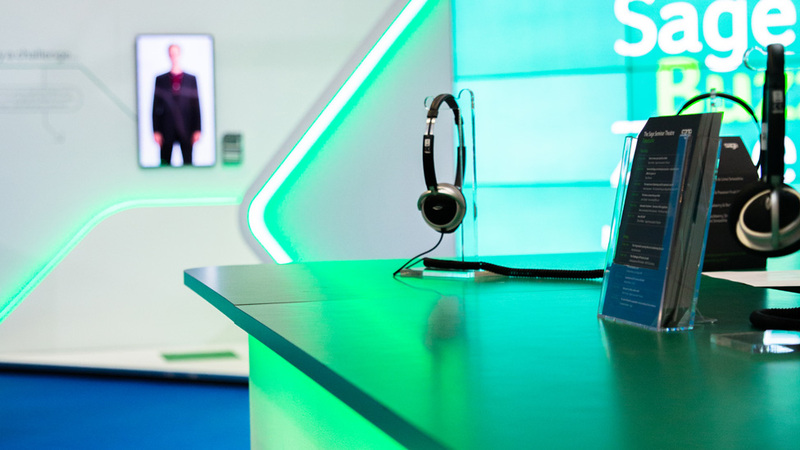 An interactive exhibition stand that helped our client reposition themselves in the financial market and delivered not only a 96% increase in leads over the previous year, of the 4,436 attendees – 82% of which were new prospects. 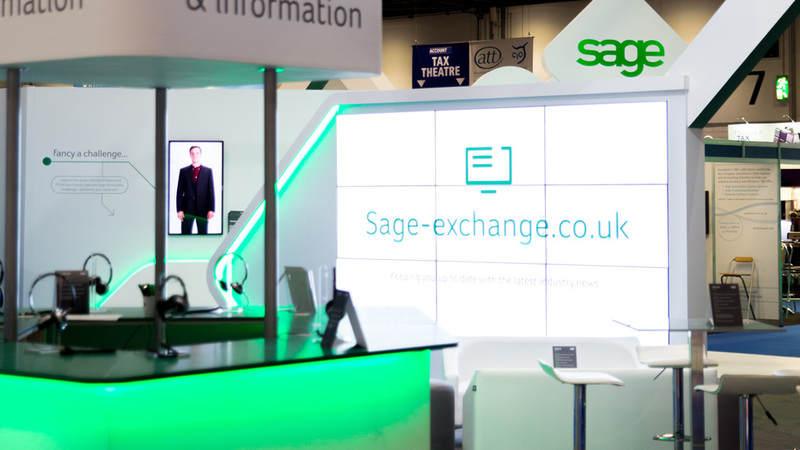 Having exhibited at Accountex – the UK’s top industry event for accountants and finance directors – for the previous two years, Sage aspired to completely dominate the show. 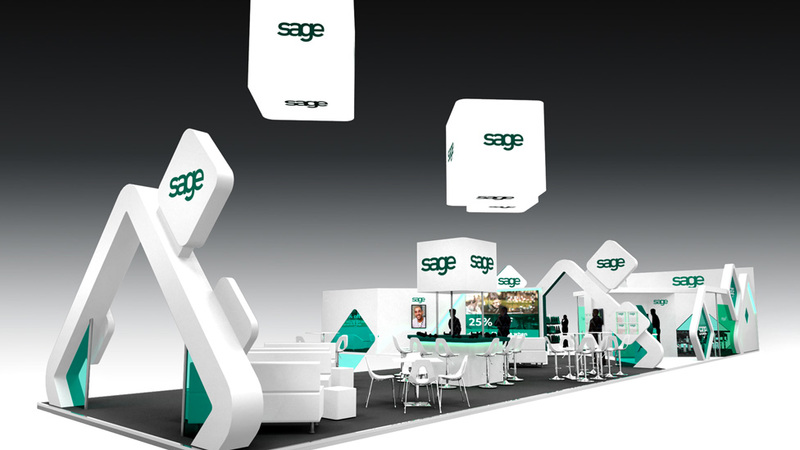 Seeking a conference experience that re-established them as the market leader in groundbreaking accounting software, Sage approached Parker Design to develop a memorable trade show exhibit that engaged both internal and external audiences. 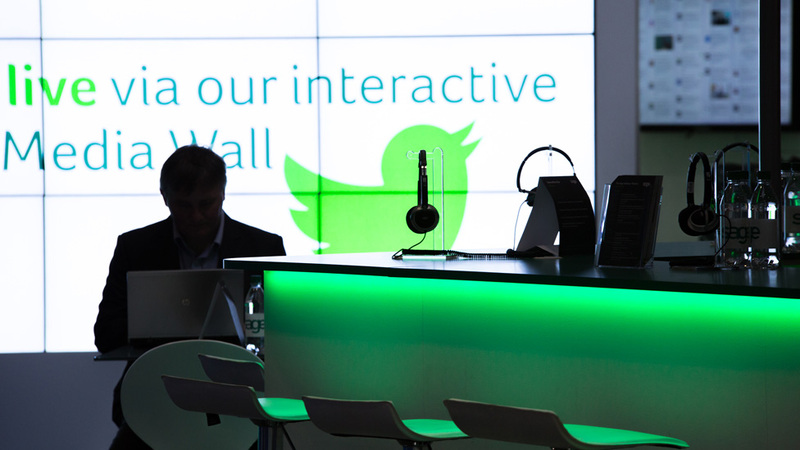 To achieve this, we designed and delivered a stunning 222 sqm interactive exhibition stand within an incredibly tight turnaround time of only three months. 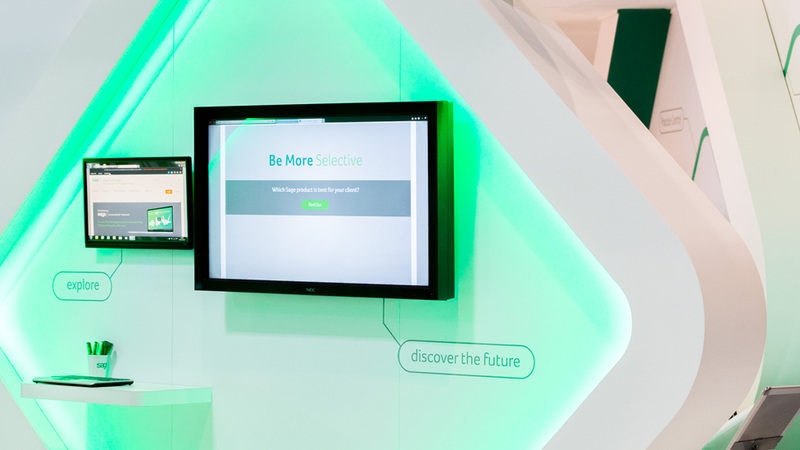 Divided into four key zones, the interactive exhibition stand sought to both heighten the experience of conference attendees and maximise exposure. 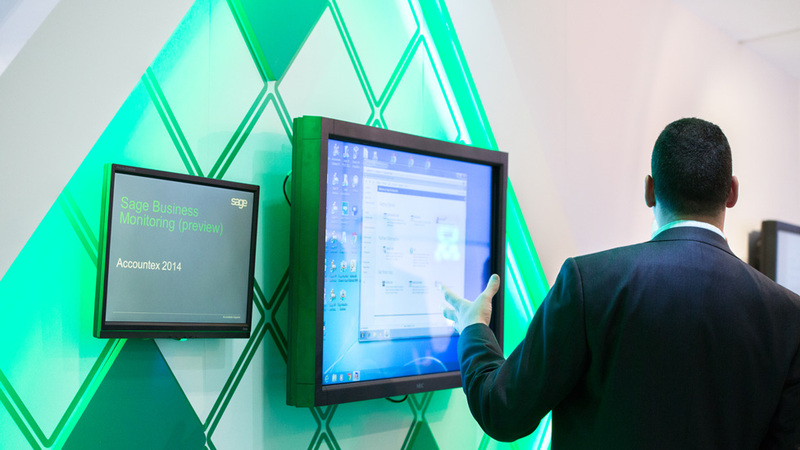 The ‘Interact Zone’ teemed with opportunities to engage with the technology, such as live software demonstrations and multiple iPads and PC stations where visitors could test drive Sage software. A ‘Seminar Theatre’ featured keynote speeches from leading industry figures, which were filmed and broadcast around the trade show stand live on giant video walls. Regardless of where they were in the exhibit, guests could access headphones to listen in. Additionally, the videos were edited and re-purposed for post-event content. The ‘Networking Zone’ offered comfortable seating and an opportunity to chat in a relaxed environment while enjoying free barista-served coffee or beverages from the smoothie bar. 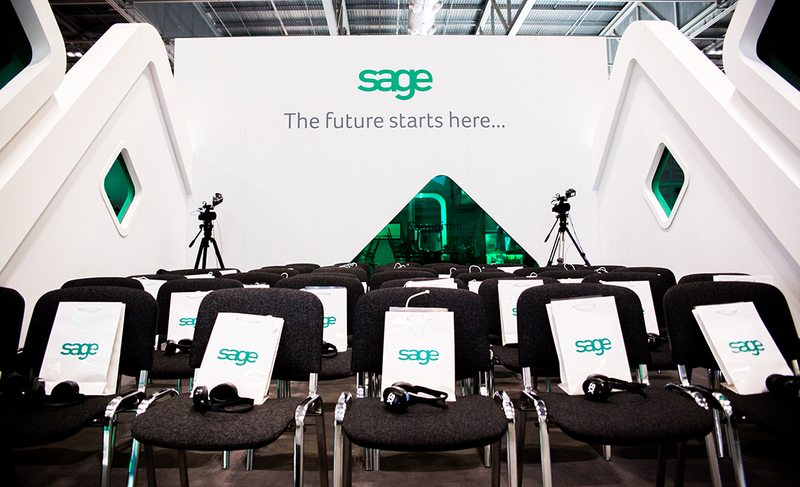 The ‘VIP Zone’, offering a unique invitation-only experience, allowed special guests to preview the pre-release of future Sage innovations and software solutions – a first for a company known for closely guarding its future development plans. 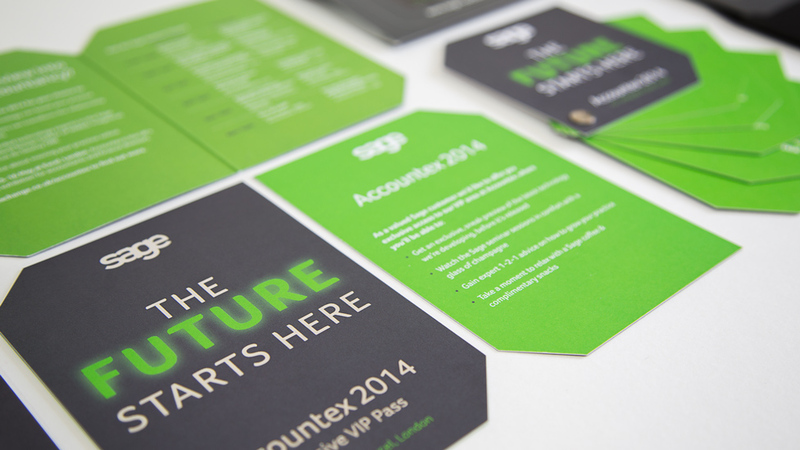 In addition to the trade show stand itself, we designed the company’s pre-show collateral, including printed and digital invitations and event guides, as well as the on-stand collateral, in-booth video content and post-event materials to ensure message consistency and maximise return on investment for Sage. The interactive exhibition stand attracted 4,436 attendees – 82% of which were new prospects – and generated 309 qualified leads, a 96% increase on the number of leads captured the previous year. High-quality contact at the event translated into significant post-event engagement with 81% of prospects opening targeted emails after the conference, and Sage experiencing a significant spike in website traffic. “From the beginning to the end Parker Design has helped us to achieve something unique, bold and modern. From the initial brief of ‘we want to be the best stand at the event’ they came up with unique designs that were sensitive to the event and our brand. As always Simon was on hand to help or offer advice which is just what you need… He was also on hand to project manage the build and went above and beyond his role in so many ways. Did Parker Design fulfil their brief? We helped deliver a successful brand experience for Balluff with a dynamic and compelling exhibition design & build that successfully showcases their latest product innovations and promotes interactivity. Their first time hosting this event, our client wanted to maximise their prime position in the hall, and be able to easily alter the design for future use. We produced a stand that radiates a sense of welcome and collaboration, and helped our client thread their story over time. Our exhibition design team created an innovative experience to help our client rid the North West of clogged sewers. As an experiential agency that has worked with United Utilities for years, they trusted our creativity and insight and were pleased with the level of consumer engagement.